The truth is, kitchens get dirty. Cabinets absolutely come into their own fair share of grime, ranging from grease splatter to sticky fingers. 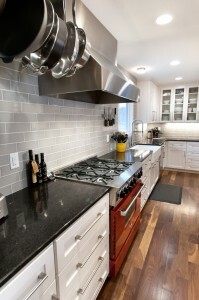 This does not mean, however, that your recently installed custom kitchen cabinets cannot keep their new look. With proper care and cleaning, you can ensure your cabinets last you a lifetime without showing their age. Basic cleaning: Create a simple combination of gentle dish soap such as Dawn (the original scent) and hot water. Your mixture should be about 1 cup of soap to 2-3 cups of water. Then use a soft sponge or a microfiber cloth to scrub your cabinets. Make sure you use gentle pressure when cleaning. You do not want to use anything abrasive or scrub too hard, as you do not want to harm the finish. After you’ve scrubbed your cabinets clean, rinse them with warm water and dry them off. Deep cleaning: Have hard-to-remove grease spots on your cabinets? Grime such as this can create a bit of challenge when it comes to getting that sparkling clean you desire. Again, we recommend that you turn to more natural cleaning solutions than abrasive, store-bought cleaners. Good cleaning solutions include white vinegar and hot water or baking soda and water. A half-vinegar, half-water solution cuts through sticky spots, while a thick baking soda paste provides great stain removing power. 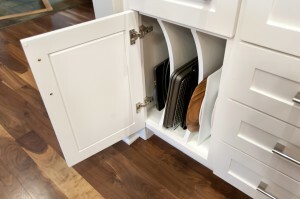 Don’t Forget About the Inside of Your Cabinets! The insides of cabinets can quickly accumulate dust and food particles. If left unclean, it is possible you may find yourself housing bugs and critters. To clean out your cabinets, first clear out the contents and wipe anything down that you have not used in a while. You can use a dry cloth or vacuum extension to remove food particles and other bits. Then use a soft cloth with a basic soap and water solution to wipe the shelves and boxes clean. Rinse with water and dry off. You will want to leave your cabinet doors open for an hour or two to let them fully dry before replacing your dishes and food items. How Often Should You Clean Your Cabinets? Wipe down your kitchen cabinet exteriors once every week or two with a dish soap and warm water solution. Wipe down your kitchen cabinet interiors once every three-to-four months. Do You Have Any Cleaning Tips to Share? We hope these tips will help you keep your kitchen cabinets clean and looking new for a long time to come. If you feel we’ve missed any good tricks of the trade, feel free to leave a comment here. 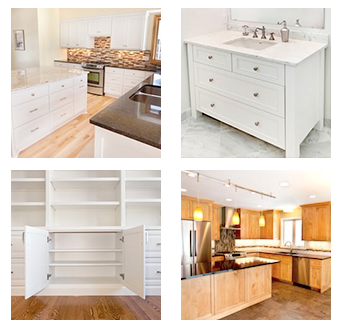 Or, if you have questions about your recently installed custom cabinets, feel free to call us at 952-737-7088 or contact our kitchen remodelers online.